Kharakhorum. Place to visited in region of Mongolia. Sights of intersest. Mongolia’s ancient capital, Kharakhorum, Chinggis Khaan’s fabled city, was founded in 1220 in the Orkhon valley, at the crossroads of the Silk Road. It was from there that the Mongol Empire governed, until Khubilai Khaan moved it to Beijing. The symbolic ruins of Kharakhorum (kharkhorin), monumental walls (400 m of length) with 108 stupas, surround the first Buddhist monastery in Mongolia Erdene Zuu Monastery, built in 1586. In 1792, it housed 62 temples and 10,000 lamas; since 1990, it has become an active monastery again. Turtles carved from the stone marked the boundaries of the complex. Nearby, Turkish monuments and rock inscriptions erected in 8-9th centuries in memory of outstanding fighters for independence. In 1220 Genghis Khan decided to build the capital city of his vast Mongolian empire at Karakorum. Building was completed by his son, Ogedai Khan, after Genghis' death, but Karakorum served as the capital for only 40 years before Kublai Khan moved it to what is now Beijing. Following the move, and the subsequent collapse of the Mongolian empire, Karakorum was abandoned and then later destroyed by hordes of Manchurian soldiers. Whatever was left was used to help build the Erdene Zuu monastery in the 16th century, which itself was badly destroyed during the Stalinist purges. 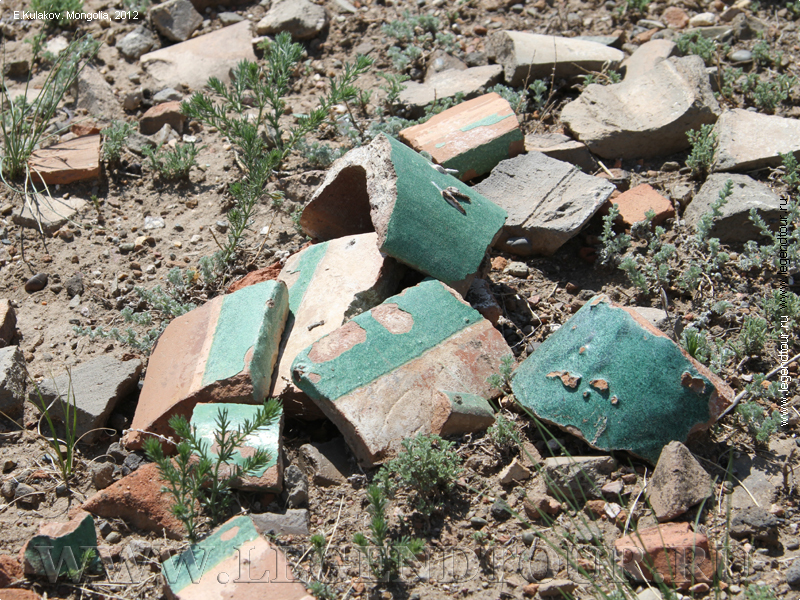 The modern and dreary town of Kharkhorin was built on the same spot. Erdene Zuu (Hundred Treasures) was the first Buddhist monastery in Mongolia. The monastery was started in 1586 by Abtai Khaan, but wasn't entirely finished until about 300 years later. It had between 60 and 100 temples, about 300 gers were set up inside the walls and, at its height, up to 1000 monks were in residence. Like Karakorum, the monastery was abandoned and then vandalized by invading Manchus. Attempts at restoration were made in about 1760 and, again, in 1808 under the direction of the famous architect Manzshir, but then came the Stalinist purges of the 1930s. All but three of the temples in Erdene Zuu were destroyed and an unknown number of monks were either killed or shipped off to Siberia and never heard from again. However, a surprising number of statues, tsam masks and scroll paintings were saved from the monastery at the time of the purges - possibly with the help of a few sympathetic military officers. These were buried in nearby mountains, or stored in local homes (at great risk to the residents). Sadly the statues are still not safe: a security system was installed in the monastery halls in early 2000 after several statues were stolen. The monastery remained closed until 1965 when it was permitted to reopen as a museum, but not as a place of worship. It was only with the collapse of communism in 1990 that religious freedom was restored and the monastery became active again. Today, Erdene Zuu Khiid still retains much of its former glory, though no doubt it's a shadow of what it once was. Restoration of the monastery is one of Mongolia's top cultural projects, but few funds are available from the government or international agencies. Temples. The monastery is enclosed in an immense walled compound. Spaced evenly along each wall, about every 15m, are 108 stupas (108 is a sacred number to Buddhists). The three temples in the compound which were not destroyed in the 1930s, are dedicated to the three stages of Buddha's life: childhood, adolescence and adulthood. See the boxed text 'Important Figures of Tibetan Buddhism' in the Facts about Mongolia chapter for a brief description of some of the gods you will see in the monastery. Dalai Lama Sum was built to commemorate the visit by Abtai Khaan's son, Altan, to the Dalai Lama in Tibet in 1675. The room is bare save for a statue of Zanabazar and some fine 17th-century scroll paintings depicting the dalai lamas and various protector deities. Inside the courtyard, the temple to the west, built by Abtai Khaan and his son, is dedicated to the adult Buddha. Inside, on either side of Sakyamuni (the historical Buddha), are statues of Sanjaa (Sanskrit: Dipamkara), the past Buddha, to the left; and Maidar (Sanskrit: Maitreya), the future Buddha, to the right. Other items on display include some golden 'wheels of eternity', naimin takhel (the eight auspicious symbols), figurines from the 17th and 18th centuries, and balm (wheat dough cakes, decorated with colored medallions of goat or mutton fat), made in 1965 and still well preserved. Look out for the inner circumambulation path leading off to the left, just by the entrance. The main and central temple is called the Zuu of Buddha. The entrance is flanked by the gods Gonggor on the left and Bandal Lham (Sanskrit: Palden Lhamo) on the right. Inside, on either side of the statues of the child Buddha, are (to the right) Otoch Manal, the Medicine Buddha and (to the left) Holy Abida, the god of justice. The temple also contains statues of Niam and Dabaa, the sun and moon gods respectively, a few of the tsam masks that survived the purges, some carved, aggressive looking guards from the 16th and 17th centuries, and some displays of the work of the revered sculptor and Buddhist, Zanabazar. In the temple to the east, there's a statue depicting the adolescent Buddha. The statue on the right is Tsongkhapa, who founded the yellow Hat sect of Buddhism in Tibet. The figure on the left is Janraisig (Tibetan: Chenresig; Sanskrit: Avalokitesvara), the bodhisattva of compassion. As you walk north you will pass the Golden Prayer Stupa, built in 1799. The temple next to this is said to be the first temple built at Erdene Zuu. Look out for the mandala on the ceiling. The large white temple at the far end is the Tibetan-style Lavrin Sum, where ceremonies are held every morning. Apart from the main temples, there are several other interesting things to see. The gravestones of Abtai Khaan (1554-1588) and his grandson Tushet Khaan Gombodorj (the father of Zanabazar) stand in front of the Dalai Lama Sum and are inscribed in Mongol, Chinese, Tibetan and Arabic scripts. In the north-east of the monastery are the base stones of a gigantic ger (now called the Square of Happiness and Prosperity), set up in 1639 to commemorate Zanabazar's birthday. The ger was reported to be 15m high and 45m in diameter, with 35 concertina-style walls, and could seat 300 during the annual assemblies of the local khaans. The hollow of what was once an artificial lake can be seen next to the foundations. Entrance to the monastery grounds is free. If you want to see inside the temples, however, you'll have to go to the administration office on your left as you enter the grounds from the south and buy a ticket for T3000, which includes a guided tour of the site. The museum is open from 9 am to 6 pm daily. The monastery is an easy 2km walk from the center of Kharkhorin. Ceremonies in Lavrin Slim usually start at around 11 am, though the times vary so ask at the office. Visitors are welcome, but photographs during ceremonies are not. A shop next to the administration office sells some good but expensive souvenirs. There is a US$5 charge to take photographs inside the temple, while using a video camera costs US$10. Outside of the temples, you may take as many photos as you wish. Turtle Rocks. Outside the monastery walls are two 'turtle rocks'. 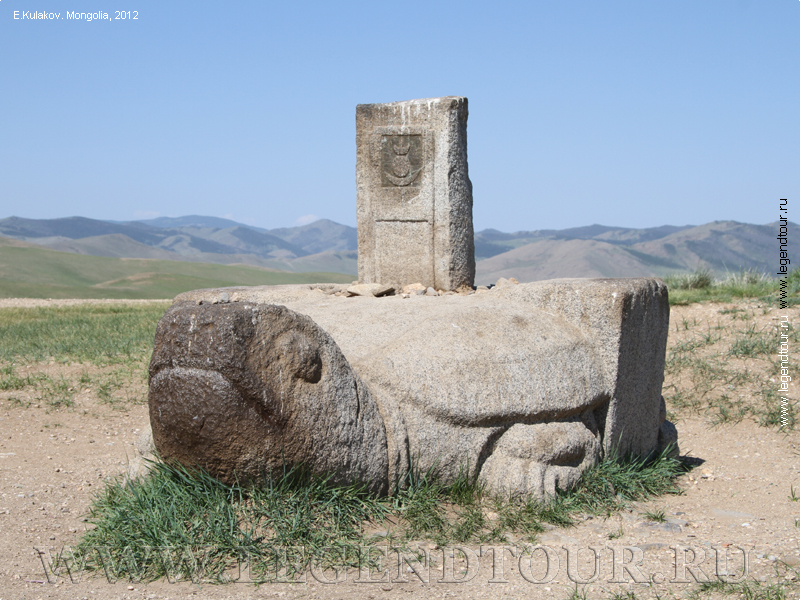 Four of these sculptures once marked the boundaries of ancient Karakorum, acting as protectors of the city (turtles are considered symbols of eternity). The turtles originally had an inscribed stone stele mounted vertically on their back. One is easy to find: just walk out of the northern gate of the monastery and follow the path north-west for about 300m. Often, an impromptu souvenir market is set up here next to the turtle rock. You'll need a guide or directions to find the other turtle rock. Phallic Rock. If you have some time, it is worth looking for the bizarre 'phallic rock', which points erotically to something interestingly called a 'vaginal slope'. It is surrounded by a stone fence, hidden up a small valley, and visible from the main road to Ulaanbaator, about 1km from Kharkhorin. It's a 30- or 40-minute walk from Erdene Zuu Khiid. You will have to ask for exact directions at the monastery, or at your hotel, that is if you can describe in Mongolian what you want to see (and exactly why!). Legend has it that the rock was placed here in an attempt to stop frisky monks, filled with lust by the shapely slope, from fraternising with the local women. Hardly a single stone remains of ancient Karakorum, the Mongol capital, but an intriguing picture can be painted using contemporary accounts of visiting missionaries ambassadors and travellers. The city was situated at the crossroads of trade routes and was surrounded by walls with four gates; each had its own market, selling grain in the east, goats in the west, oxen and wagons in the south and horses in the north. The surrounding town of gers was an impressive sight, though the missionary William of Rubruck (1215-1295) dismissed the city as no bigger than the suburb of Saint Denis in Paris. Giovanni de Piano Carpine (1180-1252), an envoy sent to the Mongols in 1245 by Pope Innocent IV, described the city vaguely as 'at the distance of a year's walk' from Rome. Marco Polo gave a brief description of the city, though he never made it there. The Mongol khaans were famed for their religious tolerance and split their time equally between all the religions; hence twelve different religions co-existed within the town. Mosques, Buddhist monasteries and Nestorian Christian churches competed for the Mongol's souls. Even powerful figures such as Ogedei's wife and Khublai's mother were Nestorian Christians. The centrepiece of the city was the Tumen Amgalan, or Palace of Worldly Peace, in the south-west corner of the city. This 2500 sq meter complex, built in 1235, was the palace of Ogedei Khaan. The two-storey palace had a vast reception hall for receiving ambassadors, and its 64 pillars resembled the nave of a church. The walls were painted, the green-tiled floor had underfloor heating, and the Chinese-style roof was covered in green and red tiles. Whenever he was at court, the khaan sat on a panther skin atop a great throne, to which stairs ascended from one side and descended from the other. You can see a model of the palace in the Museum of Mongolian History in Ulaanbaatar. The most memorable highlight of the city was a fountain designed in 1253 by the French jeweller and sculptor Guillaume Bouchier (or Bouchee) of Paris, who had been captured by the Mongols in Hungary and brought back to embellish Karakorum. The fountain was in the shape of a huge silver tree, which simultaneously dispensed mare's milk from silver lion's heads, and wine, rice wine, bal (mead) and airag from four golden spouts shaped like snake heads. On top of the tree was an angel. On order a servant blew a pipe like a bugle that extended from the angel's mouth, giving the order for other servants to pump drinks out of the tree. Mongolian noblemen lived in the north of town, near the Orkhon Col. Rubruck disparagingly describes various pleasure domes and epic feasts (during one of which the Mongol guests guzzled 105 cartloads of alcohol). There were also quarters of craftsmen and traders, populated by a great mix of people brought back to Karakorum from all over Asia. So cosmopolitan was the city that both foreign and Mongol coins were legal tender. The map of Uvurkhangai aimag.